Social commerce has gone through so many iterations, with experiments launched and killed, only to have the basic concepts revived in different ways—often in iterations that are unfortunately no better at producing direct sales than the last. But as multichannel attribution replaces the last click when it comes to assigning credit for a sale, the influence of social platforms on conversions should become more apparent. Marketers continue to invest in social commerce, even though as a direct response tool on all but Facebook, it’s still lacking. Users aren’t accustomed to clicking through to buy on most social platforms. Multichannel attribution is being used by more retailers, and more social platforms—Google and Facebook, in particular—are offering online-to-offline measurement tools. Retailers not having to rely on last-click attribution may increase the value seen in social commerce. Retailers still seem to be approaching buy buttons on social media as an add-on—as long as users are spending time on social platforms, why not insert a direct call to action? But shoppers are indifferent at best, and that doesn’t look likely to change anytime soon. Newer social media platforms like Snapchat and technologies like chatbots could pave the way for the social commerce transactions of the future. 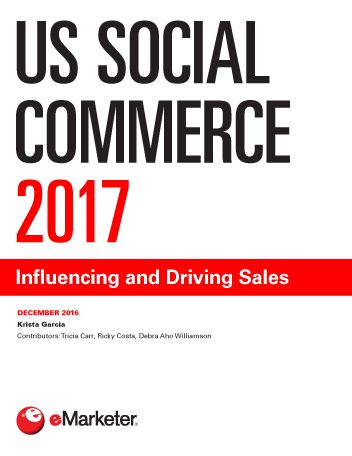 "US retailers surveyed by RIS News and Gartner in February 2016 attributed just 2% of their revenues to social commerce. However, that stat doesn’t necessarily tell the whole story."